Preheat oven to 350°. Line muffin pan with large-size paper muffin cups. In a large mixing bowl, combine flour, sugar, flax seed meal, spices, baking soda, baking powder, chopped walnuts, & raisins. In a separate bowl, beat together oil & egg. Stir in grated carrot. Add carrot mixture to dry ingredients. Stir just until evenly moistened throughout. Fill paper muffin liners ¾ full. Sprinkle the top of each muffin with a pinch of raw cane sugar. Bake for approximately 25 minutes or until top springs up when lightly touched. Remove to wire rack and allow to cool. Makes 10 - 12 muffins. 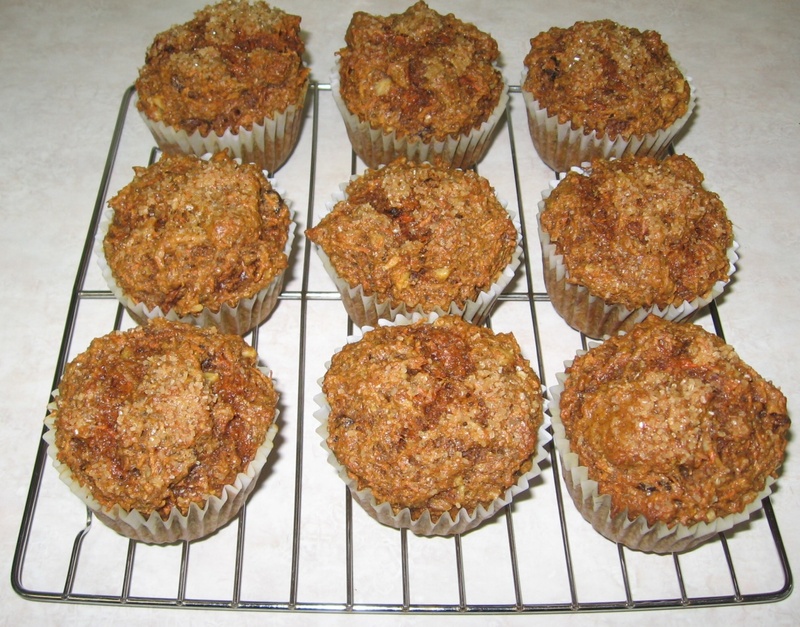 These muffins are like your own little mini carrot cake treat... only way healthier. My husband and young grandchildren absolutely love them. We're not huge fish eaters, so with the olive oil, flaxseed meal, and walnuts, they are a great way to get Omega 3's into their diets.